Dessert often gets overlooked when hosting a backyard grill party. Making a finishing dish for your barbecue is easy to do, and with a little creativity and ingenuity can be the most memorable thing you cooked all day. The beauty of making a dessert on your grill is that the cooking is done outside so there is no need to heat up the kitchen on a hot summer day. Grilled desserts get extremely fun and enjoyable when you hopscotch between sweet and savory. As an added bonus, involve the kids or grand-kids in the prep or supervised cooking process and your culinary reputation will often skip directly to legendary status. I learned the hard way that my best baking pans, cookie sheets, and muffin tins take a beating on the grill and are susceptible to aging in dog years for some reason when I use them outside. 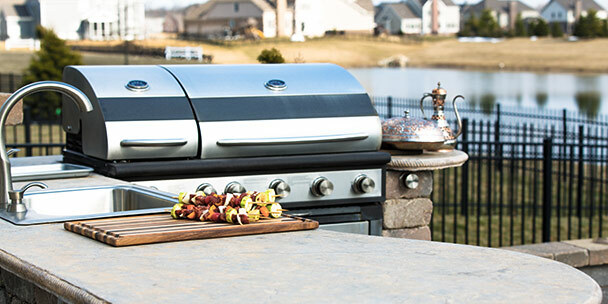 A safer bet that will keep you in good graces with your dishwashing brigade is to use disposable foil products if you need a surface to cook on other than the grill’s grates. Even better, find a few baking pans from the discount or dollar store, which may not be that much of a heartbreak if they get weathered from the grill. Regardless of whether I go the cheaper or disposable pan route, I always take caution to make sure my dessert will release from the vessel when done cooking. Covering the pans in heavy-duty foil and applying copious amounts of non-stick spray, usually does the trick. Parchment paper also works extremely well as a liner for a tray or a cookie sheet but make sure it is confined to the footprint of the pan so it is not at risk of catching fire. The grill is a versatile and fun device for making dessert, but a few minor modifications should be taken into consideration. When baking in the oven, the heat is relatively evenly dispersed from all sides. 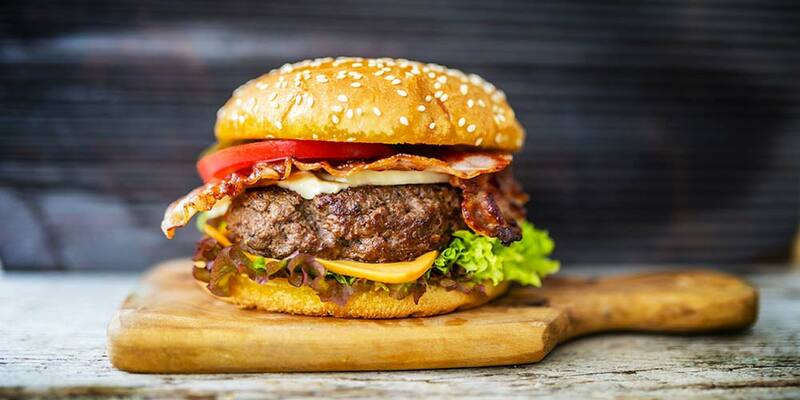 The heat from your grill comes almost exclusively from below. This can be bothersome because if you are baking something like muffins on the grill, the bottom is in danger of burning and the top can come out underdone. A good workaround is to cook with the two-zone method of heating your grill; heat half of your grill and leave the other half with the burners off. The fireless side is where your food goes. This allows the baking to happen from the ambient heat from the lit burners, versus direct heat from below. Be sure to rotate the item you are baking a few times during the cooking process by turning it 90° to promote more even cooking. It is important to rotate the pan quickly and get the grill’s lid closed so too much heat does not escape. 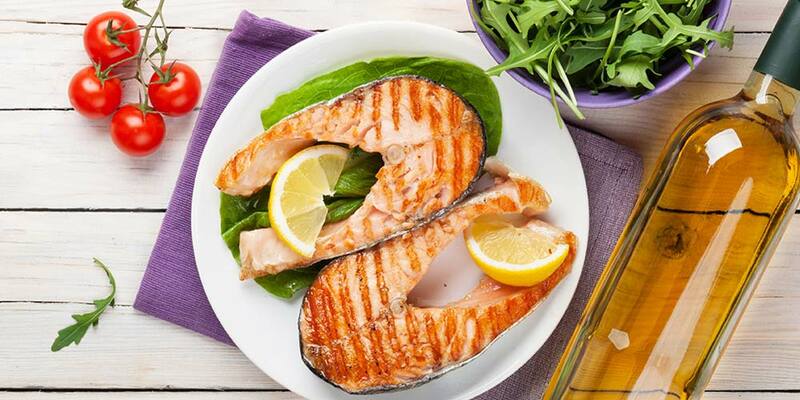 Plan for a bit of extra time for pre-heating when you use this method to make sure your grill is sufficiently up to temperature for the dish you plan to make. Grilling peaches is an amazing way to utilize one of the sweetest tastes of summer. Peaches are at their prime in the summer months, but they don’t have to be at the peak of ripeness to be delicious when cooked on the grill. I shop for this fruit a little on the under ripe side when I know it is destined for the grill. Cut the peaches in large chunks to prepare for grilling. Make one large cut on either side of the peach pit to get two large slices of peach and leave the pit behind. Typically, I prepare one peach per person and an extra peach or two in case someone wants a second helping. When the peaches are prepped, I place them in a zipper top bag with ¼ cup of lemon juice and 1 tsp. of ground cinnamon, mixing until the peaches are well coated, and then store in the refrigerator. 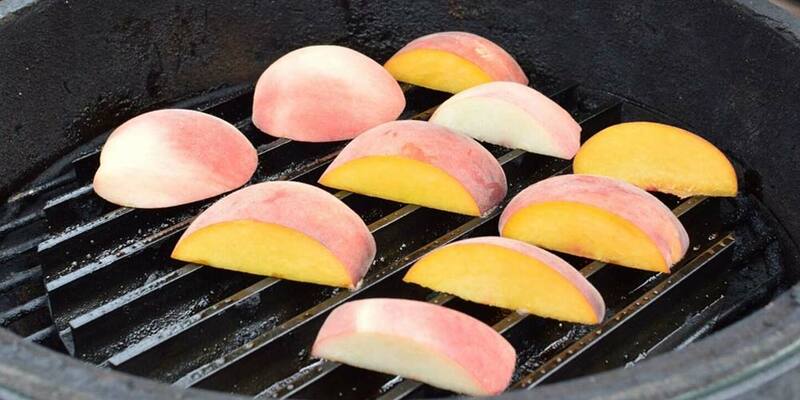 When it’s time to grill the peaches, make sure your grill is well heated and the grates are clean. Place the peaches on the grate cut-side down over medium heat. Grill time depends on how ripe or crisp the peach is, but typically you will grill the peach for 8-10 minutes per side until it becomes fork tender. I like to serve grilled peaches with a dollop of honey, Greek yogurt and a sprinkle of granola on the top. The sweetness of the peach with the tartness of the Greek yogurt and the crunch of the granola work really well together and create a light and balanced dessert. For extra bonus points, serve the dessert in a martini glass fresh from the freezer with a sprig of fresh mint from the garden as a garnish. As a kid, no camping trip was complete without making s’mores over a campfire. As an adult, I love the way the graham crackers, marshmallows and chocolate melt together for a gooey, crunchy treat. The s’more pizza combines all of the same flavors, but no campfire is required. S’more pizza is an easy adaptation of the hand held version except it is served in slices. Pre-made pizza dough from the supermarket rolled into about a 14” wheel on a well oiled pizza pan is the base of the dessert and can be kept in the refrigerator until you are ready to grill. Brush the rolled out pizza dough with about ½ cup of melted butter and sprinkle on about ½ cup each of graham cracker crumbs, chocolate chips, and mini marshmallows. Grill using the two-zone method at about 375°F for 10-12 minutes or until you get the amount of melt on the chocolate and color on your marshmallows you desire. Just like regular pizza, be sure to allow it to cool before you take a bite. This same grilled dessert recipe can easily be converted into a s’more dip with the addition of a cast iron skillet. Simply follow the same instructions above, but replace the pizza dough with a skillet. An amazingly easy dessert, grilled pineapple upside down cake can be made in a bundt pan or loaf pan for amazing presentation. Sprinkle brown sugar into the bottom of a well-greased pan. Then lay down pineapple rings with a maraschino cherry in the center. Use an easy white cake mix and pour the batter over the fruit. Bake using the two-zone method, following the cake mix’s specifications until done and an inserted toothpick comes out clean. Carefully invert and release the cake onto a serving platter. For an extra flavor layer, grill the pineapple rings before you put them in the cake pan. A warm, grilled pound cake with cool berries and whipped cream on top is a makes a great finish to your meal. Slice a quart of cleaned and hulled strawberries, blueberries or raspberries. Sprinkle ½ cup of sugar over the fruit about 90 minutes before serving. Keep the berries cool in the refrigerator and give them a stir once or twice before dessert to evenly distribute the sugar. A prepared pound cake can be found at most grocery store bakeries and makes an ideal base for the sweetened strawberries. Cut the pound cake into inch and a half thick slices and grill them to toast the cake for 2-3 minutes per side until you get a gorgeous golden brown. Top with the sweetened strawberries and a couple of spoons of whipped cream. Cookies and brownies are easy to make, and chances are you can talk some helpers with tiny hands to take part in the preparation. Prepare the cookies or brownies based on your favorite recipe or make it even easier using a semi-prepared offering from the dairy section at the grocery store. Similar to other baked items on the grill, use the two-zone method and be sure to rotate a few times during the cooking process. A summer day with warm cookies or brownies and vanilla ice cream makes dessert simple and sweet, just like summer to me. Vanilla ice cream is the classic, but I prefer mint chocolate chip. For bonus points, roll the ice cream cookie sandwich in sprinkles or chocolate chips to help keep the ice cream from melting out in the hot sun. Regardless of what grilled dessert you decide to make for a sweet, finishing course to your backyard barbecue, remember to keep it simple and have fun with it. Chances are it will be a home-run with your guests.